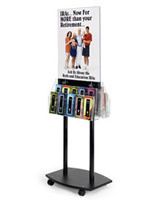 A Magazine Rack has 10 Pockets for You to Place Brochures In. Wheels Included! 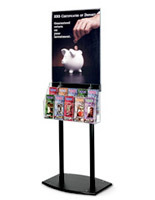 Poster frame comes with 2 literature trays allowing for double the brochures! 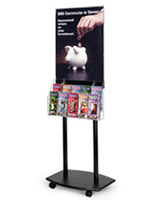 Showcase your posters with style and class in this black acrylic poster display fixture. 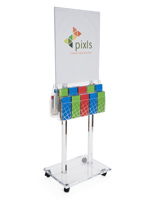 Attached roller wheels give you the flexibility to move this unit as needed. 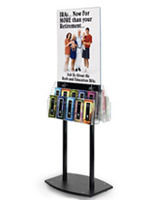 Two 5 pocket attachments will hold brochures or magazines on both sides, allowing you to provide additonal information to customers. 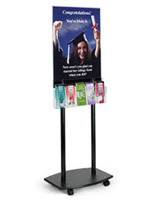 This poster display fixture holds (2) 22"w x 28"h posters for double-sided viewing. Black MDF base measures 24" wide by 18" deep. Display is 67" tall not including the casters. 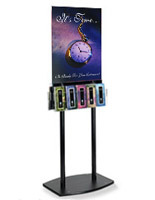 (Casters add about 3" to the total height.) Comes with 4 roller wheels and all hardware. 18.0" x 70.0" x 17.5"